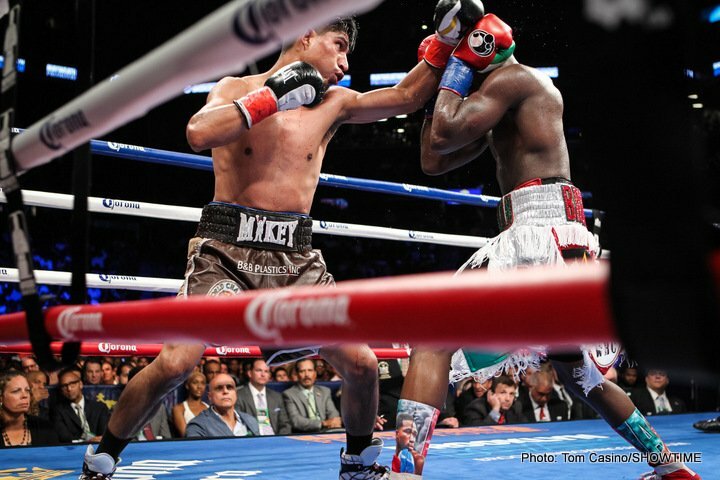 As per a news piece by Dan Rafael of Espn.com, talks have begun for a lightweight unification clash between Mikey Garcia and Jorge Linares, to take place early next year some time. Eric Gomez of Golden Boy will meet with Garcia himself today and Gomez tells Rafael how both fighters want the bout to take place. It is indeed a great fight on paper. Garcia, 37-0(30) is coming off a wide decision win over Adrien Broner in a non-title fight that was fought at a catch-weight above 135 pounds. Linares, 43-3(27) is coming off a close, even debatable, split decision win over Luke Campbell. Arguably the two best operators at 135 today barring all other fighters, Garcia and Linares should put on quite a fight should they meet as is the plan. Garcia is the harder puncher of the two, and though it was a long time ago now (back in 2011/2012) Linares did show vulnerability in being stopped twice, back-to-back by Antonio DeMarco and Sergio Thompson (Linares also being stopped in 2009, by Juan Carlos Salgado). Might Garcia overpower Garcia, even expose his chin? Linares is a fine boxer, and he has been in with punchers since the days of his three stoppage setbacks, and in winning 12 fights since his last defeat the 32 year old says he is a different fighter these days. If Linares can either take Garcia’s power shots or avoid them, he could well box his way to a decision win. Garcia, though, might be the fans’ pick to win this one; based on his great power and the fact that he has never, ever lost. Added to this, Garcia is the younger man by three years at age 29. Wherever it’s held, this one, if it indeed happens, will almost certainly prove enticing to the fans. A unification fight – this one would see Linares put his WBA title on the line against Garcia’s WBC belt – is always a good thing and this fight would be no exception.